....studied classical guitar at the "Fachbereich Musik der Universität Mainz" (Walter Schumacher-Löffler) and graduated many Master Courses. ....studied classical guitar at the "Wiesbadener Musikakademie" and at the "Staatliche Hochschule für Musik in Karlsruhe" (Andreas von Wangenheim). The Duo was founded in October 2010. We decided to call it Gravy Train Guitar Duo, because the famous saying "to climb or get on the gravy train" makes an ironic statement to the standing of freelance musicians. Our repertoire contains transcribed Lute music for the renaissance, baroque sounds e.g. 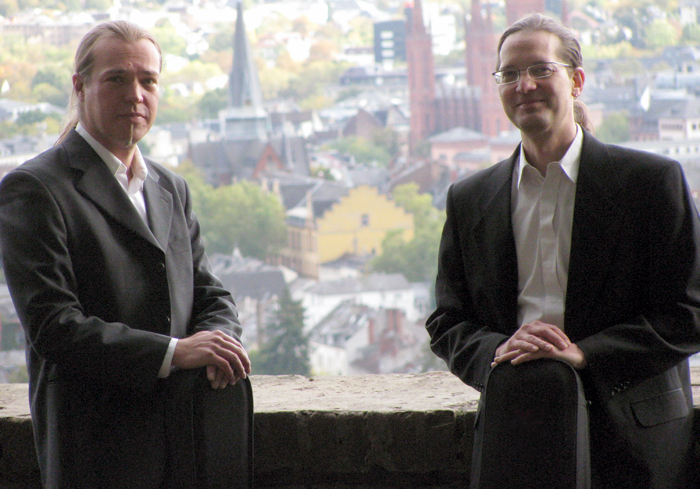 from J. S. Bach and Bernardo Pasquini and Original Compositions for Guitar Duo from the 19th century. The main focus is the modern, contemporary Music for Guitar from Composers like Leo Brouwer, Günther Zabernigg and Holmer Becker (among others). Our Concert Program makes full use of the tonal possibilities of the classical guitar. The transcriptions of Piano Music for Guitars offers a new outstanding sound experience.